The 2018 Estates of Brentwood Annual meeting was held on April 16th. Patrick O’Rourke presided and reviewed the presentation below. Austin City councilman Jimmy Flannigan attended and also reviewed the Anderson Mill Road proposed improvements that will occur on the stretch of road starting at Spicewood Parkway to 183. The main improvements include the addition of a center turn lane and a median at the 183 intersection to keep traffic from attempting blind left turns from the Starbuck’s shopping center. Sidewalks will also be added where they are missing. The Estates of Brentwood HOA will hold its annual meeting on Sunday, April 23rd at 3PM. This year the meeting will be held at the Hope Presbyterian Church at 11512 Olson Drive across from Spicewood Elementary School. The Estates of Brentwood HOA will hold its annual meeting on April 24th at 3PM. This year the meeting will be held at the Hope Presbyterian Church at 11512 Olson Drive across from Spicewood Elementary School. Please see the flyer sent to all homeowners. Over the past year or so your HOA Board of Directors has discussed what we believe is a need to upgrade our entrance features to better reflect the quality, beauty, and ambiance of our community. At issue are a few concerns; we believe that the present signage is a bit small and/or is not well placed and we know that the letters are prone to fall off the façade and/or have been vandalized. Given these issues, and of course others you may have noticed or considered, your Board plans to renovate the existing neighborhood entrance features including the signage and / or wall structure located at Anderson Mill Road and Centennial Trail. Your HOA Board is looking for new and creative design ideas that would effectively represent the prestige of our neighborhood and enhance the esthetic beauty of the entrance. We encourage ideas around a simple fix; i.e. new signage on the existing wall. Or, a complete redo of wall and signage, either out in front of a new wall or placed on a new wall. We look forward to making improvements to the entrance that we all pass on a daily basis. I have been seeing other neighborhood associations using a new social media website called nextdoor.com. Nextdoor is a social networking service for neighborhoods in the United States that allows users to connect with people who live in their neighborhood. The interesting part is that they verify your mailing address via a postcard sent in the mail to ensure you belong to the neighborhood. 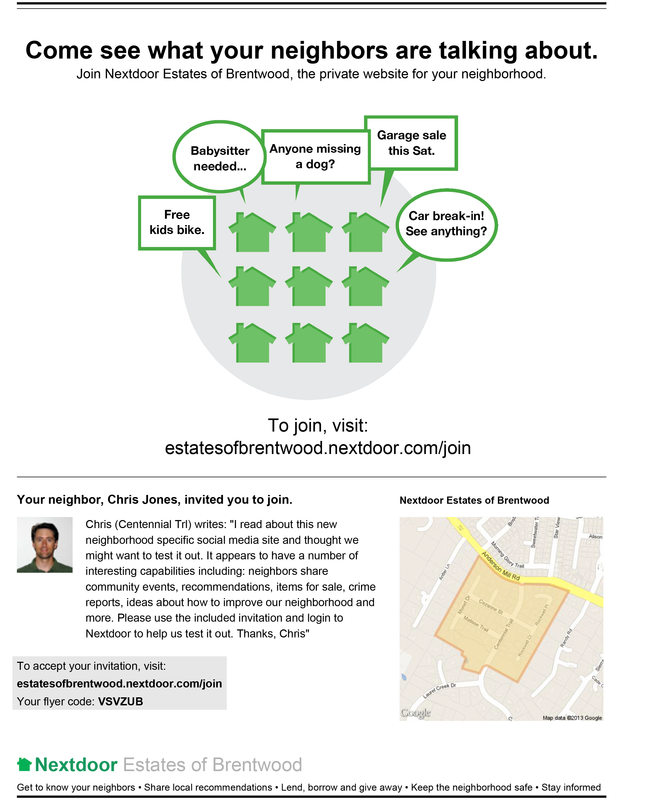 No one outside the verified users can access the information we place on the Estates of Brentwood Nextdoor site. I believe this may be a good secure place for us to store our Neighborhood Directory since it requires users to login and it verifies you indeed live in our neighborhood.